Medical Features > DICOM PACS Messaging > Storage Server > Using the Patient Updater > FAQS > How do I Delete a Series from the System? How do I Delete a Series? 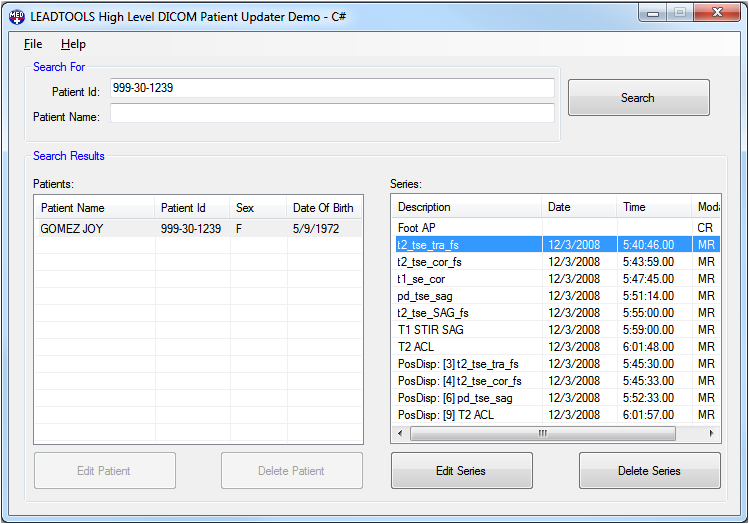 Double-click the desktop icon for the LEADTOOLS Patient Updater. When the MiIPACS Patient Updater dialog appears, move the cursor to the Patient ID field and enter the Patient ID of the patient that contains the series that you want to delete. 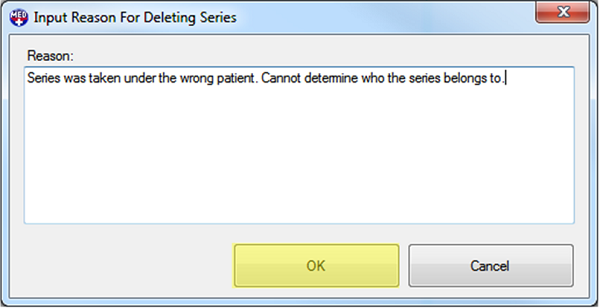 Note: Deleting a series does not delete the entire patient record UNLESS it is the last series in the patient record. Next, click Search. The Patients list view fills with the results of the search. 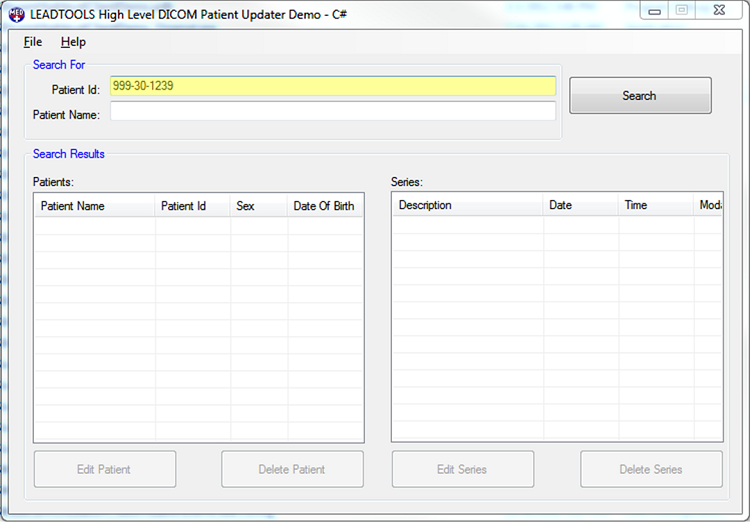 Select the correct patient record from the Patients list view on the left side of the LEADTOOLS Patient Updater dialog. 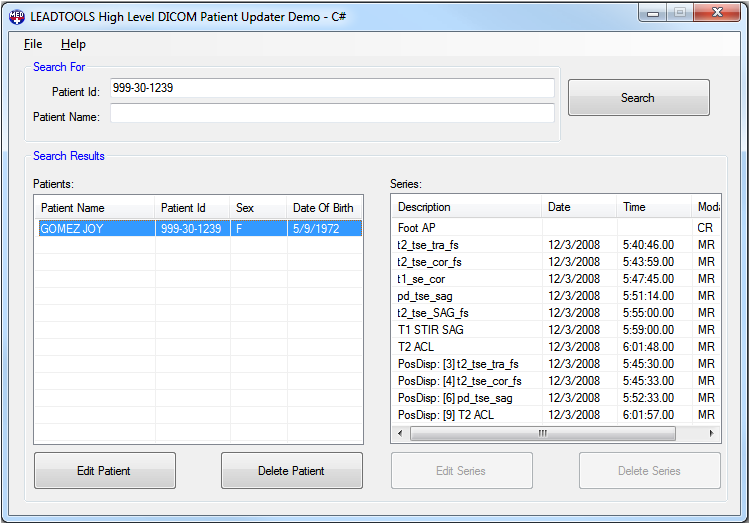 A list view displaying that patient's individual series appears on the right side of the dialog. After selecting the correct Patient, select the series that you want to delete from the Series list view on the right side of the list. Verify that the selected series is the series to be deleted from the patient record, then click Delete Series. Note: The Delete Series button is disabled until a series is selected. Clicking Delete Series button opens the Input Reason For Deleting Series dialog. The OK button is disabled until a reason is entered. Enter the reason why the series was deleted. After entering the reason for deleting the series, click OK to confirm. The series is deleted from the system.